Running a startup can be a thrilling experience, but finding capital can be a challenge. Many startup businesses reach out to friends, family, angel investors and crowdfunding to start their business. While these techniques can work, it is also possible to get loans for startups. This option can help the business to build credit and obtain immediate funding when it needs it. 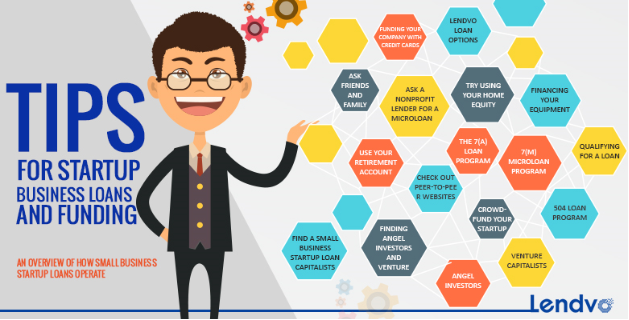 Whether you are looking for loans for startups or are considering alternative financing options, these techniques can help. When getting started, you will need to have a decent credit score. If you have a 700 credit score or higher, you will be able to find lenders who are willing to create a loan for your company. Since many of these loans are interest free for several months, the lender will want assurances that you will be able to pay back the loan. Often, approval will take up to one month for a credit line. A startup line of credit will normally have a 0 percent interest rate for the first 9 to 15 months. Afterward, the interest rate will rise to 7.9 to 19.9 percent. During the interest-free period, be extremely careful about how you use your credit line because you will only have to pay back what you borrow. If the bank gave you a $100,000 credit line, you do not have to use all of it. Someone who only uses $10,000 of the credit line will only have to pay back the $10,000 borrowed and any interest that applies. If the interest rate is 10 percent, you would need to pay back $11,000. You can also draw on the total credit line as you pay back the initial amount with interest. The average annual interest rate for a credit card is 16 percent, so using a credit card to borrow money can be costly. Despite the costs, research by the National Small Business Association showed that 37 percent of small companies used a credit card to finance some or all of their business expenses. At times, this technique can be effective. While the annual interest rates are typically high, many credit cards have 0 percent interest promotions where the borrowed amount is not charged interest. Other programs like rewards options, points and cashback may bring in additional benefits from using the card. In addition, using credit cards can help to build credit for the business and allow you to consolidate debt. Despite some of the apparent benefits of credit cards, there are some drawbacks to this funding approach. The obvious problem is that credit cards charge higher interest rates than most business loans, which can sap the financial vitality of your business. Using your personal credit cards for business can hurt your credit score and leave you unprotected if the business fails. Even when you are able to use credit cards correctly, the credit card companies can randomly lower your credit limit. If this happens, it removes potential funds from your business and can hurt your credit score. If you have decided to use a credit card to fund your startup business, begin to work on getting a better credit score. Most card companies require you to have a score of 660 or higher to qualify. At the very least, a higher score will enable you to get a lower interest rate. Since you do not want to use your personal income for the business, apply for business credit cards. Over time, the business will begin to develop its own credit rating that is entirely separate from your score. You should also start to expand the amount of credit available to you. Use a portion of the credit cards for the business so that the credit card companies do not remove some or all of your available credit. The cost of a family loan depends entirely on your friends and family. While some family members will refuse to accept interest payments, loans generally have a 0.38 to 1.85 percent interest rate. You can take their money as a loan or sell them a share of the business. Normally, it is better to take the money as a loan since most people are not sophisticated investors. When someone is given a share in the company, they expect to have a say in the way the business is run. Unless you want to get financial advice and business direction from your grandmother, a loan is generally a better way for the money to be handed out. With a rollover for business startups, you can use your retirement account for a startup business. Unlike most situations, you are not charged early withdrawal fees to access the money. These types of accounts generally cost $5,000 initially and about $1,500 annually through fees. When you use your retirement account, you are basically buying a share in your company using your 401K/IRA account. If your business earns a profit and can pay shareholders, your 401K would begin earning money from it. To fund your business with a Rollover for Business Startups (ROBS), you will have to change your business to a C corporation. You will want to talk to a specialist in this industry, since filling out paperwork and navigating the process can be challenging. There are several nonprofit lenders that are set up exclusively for startup microloans. These loans often charge an annual interest rate of 18 to 25 percent, which can be fairly steep for startup businesses. In addition, many states require startups to borrow at least $30,000. The nonprofit lenders typically require a decent level of cash flow, or they will ask for the loan to have a co-signer. Using your home as equity generally costs just 2 to 5 percent in closing costs and a 3 to 6 percent annual interest rate. Depending on the bank, closing costs may be waived for homes worth less than $500,000. To use your home as equity, you must have paid at least 15 percent of your property’s current value. Depending on your current financial situation, the bank may allow you to borrow 70 to 85 percent of the value of your home and mortgage. A home equity line of credit and a home equity loan are basically second mortgages. Your home is the collateral, and your credit stems from your home. While these options provide you with easy access to funds and a low interest rate, you are placing your home at risk. If you cannot pay the loan back in the future, you could lose your home. Peer-to-peer sites generally provide three to five year loans for debt consolidation, personal loans and business loans. These websites typically let you borrow up to $35,000 or more from strangers. You must pay a 5 to 26 percent interest rate as well as a 1 to 6 percent origination fee. You will have to have at least a 620 credit rating or higher to apply, and the loans can be expensive for individuals with weaker credit ratings. Be careful with these loans because you will be the person who repays it, whether your business is successful or not. In some ways, angel investors and venture capitalists are the cheapest way to get a loan. They generally charge nothing for the loan upfront, but they expect to receive shares of the business. Angel investors are normally wealthy investors looking for a good company. Meanwhile, venture capitalists are typically someone who represents a firm that wants to gain a share in the company. With both options, you have to decide on the terms and the shares given in the company upfront. An angel investor is normally a wealthy individual who contributes $25,000 to $100,000 to the company. They are often more flexible than venture capitalists and less concerned about getting an immediate return on the investment. An angel investor will generally gain a share in the business and some control over your company to protect their investment. Finding an angel investor is all about networking with the right people. Often, an angel investor is someone that you know who wants to invest in the business. There are angel investor connection websites online that can help you find angel investors. Once you do find an angel investor, the best option is to create a convertible note. With a convertible note, you get an easier investment process and lower legal fees. This funding option also removes the impetus to decide how much the company is worth because the value is decided after the next investment in the business. The entire goal of a venture capitalist is to find a startup business that offers a significant rate of return on their money. Often, a venture capitalist will look for a business that can give them 10 times their initial investment in just five years. Since many startup business cannot guarantee such a high return rate, it can be difficult to reach out to a venture capitalist. Unless you expect your business to earn exceptional profits, a venture capitalist will generally prefer to take their money elsewhere. A small business startup loan is offered through two different ways. The SBA offers a microloan and a community advantage program. While the microloan program provides less than $50,000 in capital, the community advantage program offers up to $250,000. The lender is approved by the SBA to provide the loan, and the SBA loans are generally given to self-financed startup companies. If you can get one of these loans, the interest rates are generally in the 7 to 9 percent range. One of the most popular SBA loan programs is the 7(a) loan. This option allows you to get up to $750,000 from a local lender because part of your loan is guaranteed by the SBA. The lender gives you the money, and the SBA just guarantees that some of their money will be returned. It makes lending to a startup less risky for a bank, which can open up your liquidity. Depending on the amount you borrow, you may be directed through 7(a) loan programs like the Lowdoc program. This option requires just a single page of paperwork, and it is only available for amounts less than $150,000. With the SBA Express program, you can get up to $250,000 in a short period of time. This particular program was so successful that it led to the creation of the Community Express program. The new option allows low- and moderate-income entrepreneurs to access working capital. To get any 7(a) loan, you will have to be a small company with less than $22.5 million in net income. Banks will want you to show at least two to three years’ worth of records and financial documents. While some banks let you use money from family members as equity, you will generally have formalize the money from your family as a loan that is subordinate to the bank’s loan. If you want a small loan of $35,000 or less, you can use the 7(m) Microloan program. This program is designed to help people start and grow a company. The funds are loaned directly from the SBA, and they are administered by business owners who work with intermediary lenders based in the community. Any new business is eligible to get a loan through the 7(m) loan program. On average, small business owners receive $10,000 in startup money from the 7(m) Microloan program. The only downside to this option is that it requires borrowers to take classes and training in business. While the training is free, it can be a waste of time for experienced entrepreneurs. This loan program was designed to give businesses help with asset purchases like equipment, machines or land. The asset purchase is funded by a lender in your area, and a second loan is given from a certified development company (CDC) . With the CDC loan, the SBA guarantees 40 percent of the asset value and contributes 10 percent from the borrower’s equity. While this loan program can offer help with asset purchases, the money cannot be used to consolidate debt, find working capital or boost your inventory. The way you use the loan is limited, but the 504 Loan program can offer a decent alternative if you need to make an asset purchase. There are websites that allow you to crowdfund your startup. If you have an interesting product, an appealing pitch or rewards for supporters, crowdfunding can be a viable option. Often, you will be expected to pay 5 to 10 percent of the money raised to the website that hosts crowdfunding. You will also be expected to offer incentives, products or rewards to the supporters. As you begin your business, you may need to get a startup loan for your equipment. In general, the lender will use the equipment as your collateral. This allows you to get a lower interest rate while you work to build your business. Lenders will often want to have a 680 credit score or higher to provide a loan for equipment. You will have to tell the lender how you plan on using the equipment, receive a vendor quote and provide a detailed credit report. Although the interest rates for equipment financing vary, most lenders charge about 20 percent. While these interest rates are higher than many credit cards, the money can help you to get started in your business. If you borrow $10,000 to buy equipment, you will need to pay back $12,000 once the 20 percent interest has been added. If you have to pay back the amount over five years, your monthly payment would be around $200 per month. Although lenders prefer established companies, many new businesses can still get loans for their company. If you do not have a long enough credit history or revenue from your company, the lender will generally look at your credit score instead. A higher personal credit score will increase your chances of getting loans for startups. With a startup loan, you will generally have limited paperwork, traditional loan options and interest-free credit line options. Unfortunately, you will have to have excellent credit for some of these loans and getting the loan could limit your ability to obtain another loan or funding source. Through online lenders like Lendvo, small business startups can quickly and easily access capital. Lendvo offers working capital loans for up to $100,000. Monthly rates for these loans start at 1.5 percent per month, and there are flexible terms available. As a working capital loan, this funding option allows you to cover expenses during slow times or temporarily cover operational costs. The application process requires a credit report, financial records, a list of assets and any liabilities faced by the business. Overall, a better credit score is more likely to garner a better interest rate for these loans. Once awarded, the loan is repaid over a set period of time that ranges from one month to two years. Whether you are just starting a business or need working capital, there are many ways to find startup money for your company. Like any legal or financial agreement, you need to make sure that you get everything in writing and read through the terms of the agreement. From loans for startups at Lendvo to SBA loans, there are options available to get your business running. Establishing credit, using the funds wisely and reaching out to new funding sources can help you to prepare your company for success.